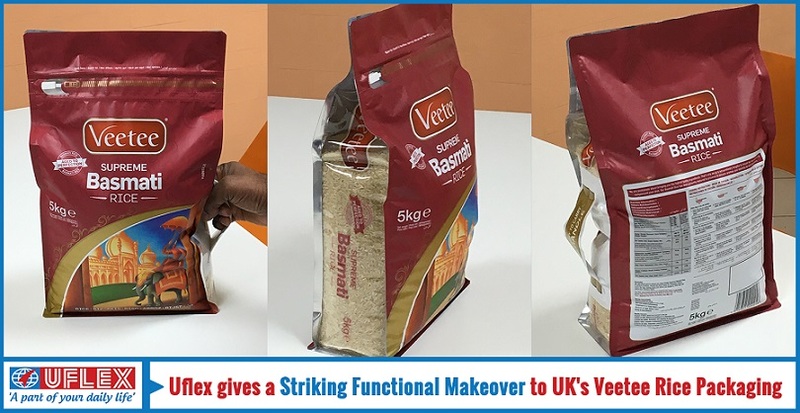 Veetee – one of the largest rice suppliers in the United Kingdom had been facing four obstacles that were stymying its overall brand value (a) Diminished shelf appeal of the big bags at the point of sale (POS) (b) Ergonomic discomfiture to consumers while carrying the bags (c) Restricted openabilty of the bags posing difficulty in accessing the product(d) Poor stackability quotient with frequent slipping of bags. Uflex offered Veetee a stunning three-dimensional pack with front openability through a Slide to Close (STC) zipper. The front, back and bottom panels of the pack are a 3 ply structure comprising Stackable Polyester/ Metallized Polyester/ Polyethylene (Sealant layer). The side panels/gussets are made of Polyester/ Polyester/Polyethylene that make it convenient to have a provision for transparent windows on either side so that the consumers could see through the rice packed inside and make an informed choice. The re-closable feature of the bag allows consumers to retrieve only the required amount of product at a time and using the rest later without hampering the quality or aroma. Thus the barrier properties of the bag remain intact through-out the prescribed shelf life of the product.